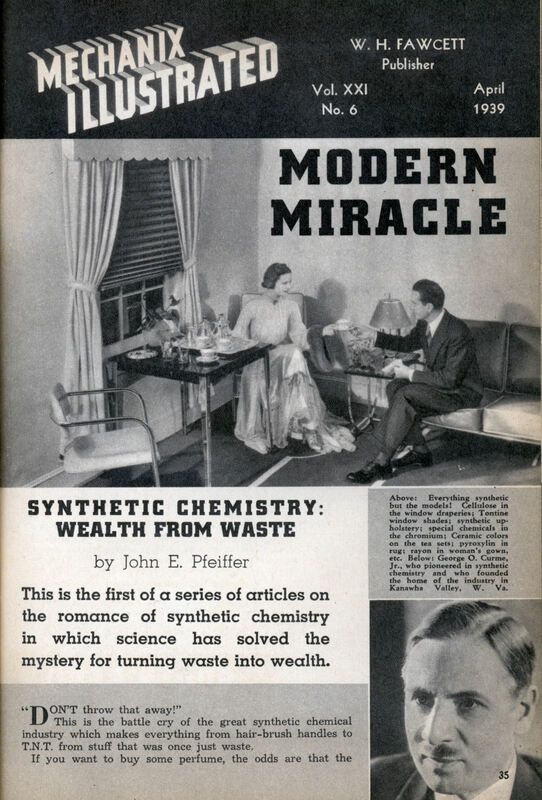 This is the first of a series of articles on the romance of synthetic chemistry in which science has solved the mystery for turning waste into wealth. “Don’t throw that away!” This is the battle cry of the great synthetic chemical industry which makes everything from hair-brush handles to T.N.T. from stuff that was once just waste. If you want to buy some perfume, the odds are that the bottle will contain odors extracted from coal tar, once a nightmare to factories who paid people to get rid of it. 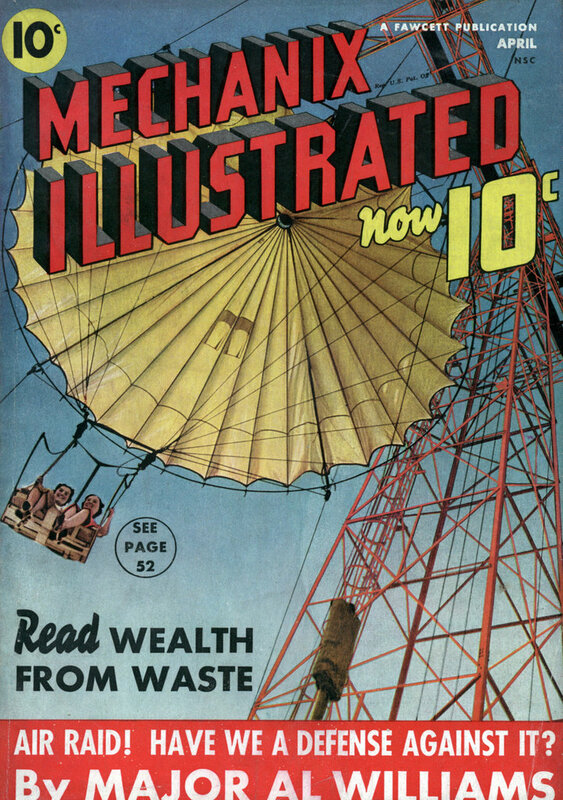 But today, whether it’s waste gas, tar, or peanut shells, the chemists want it to sell back to you again in the form of motor fuel, photographic film, or pipe stems. What men do with rubbish would turn the most efficient housewife green with envy and the whole thing only started late last century. In 1839 a person’s clothes, medicines, and most other necessities were made out of materials taken from plants or animals. Most raw materials came entirely from age-old sourcesâ€”silk from worms, wool from sheep, and cotton and linen from plants. Plants and trees were the source of rubber, paints, perfumes, and flavors for beverages and desserts. But in the later 1800’s scientists began tt> rid men of their dependency upon natural plants. They started to do near-miraculous things with the thick, oily tar left from heated coal. Flowers and vegetable oils played second fiddle as perfumes, tasty flavors, and life-saving drugs were made from the 200-old compounds that compose the evil-smelling black coal residue. The Germans were leaders in this work and before the World War they had practically cornered the world’s synthetic-chemistry market. Hundreds of scientists flocked to Germany to study the art of turning chemical knowledge into dollars and cents. Among them was George O. Curme, Jr., a young American who came from a small town in Iowa and was living on a very closely figured budget. One day he went to the front door of chemistry’s Inner Sanctum, the vast synthetic-products trust, I. G. Farbenindustrie. Hesitatingly he asked an official to take him on a tour through the mammoth chemical worksâ€”but he got the German equivalent of the gate. Today Dr. Curme might receive a more cordial answer, for after the refusal the young chemist returned to Americaâ€”missing the War by a bare two weeksâ€”broke, but with big ideas. Several weeks passed. Then he got a job with an affiliate of the Union Carbide and Carbon Corporation and began tinkering with test tubes in a laboratory of the Mellon Institute in Pittsburgh. He worked five years extracting chemicals, not from coal tar, but from natural gases that rise up like steam from 10,000 square miles of underground pits in the United States. While many of these gases had been wasting themselves into thin air for centuries, Curme was determined to give them a new job. Finally things had progressed far enough for a try-out and July, 1920 saw the formation of Carbide and Carbon Chemicals Corporation â€”a special company to test the commercial possibilities of Curme’s researchâ€”in the Great Kanawha River Valley near Charleston, West Virginia. The site was well chosen. Billions of cubic feet of natural gas lay beneath the soil, a large proportion of West Virginia’s total reserve of 3,000,000,000,000 (three trillion,) cubic feet. Furthermore, geologists estimated that Kanawha had an untapped coal supply of about 24,000,000,000 tons, enough to last 1,300 years, and the valley also contained oil fields and salt springs for valuable industrial chemicals such as chlorine, sodium, and bromides. In this gigantic natural supply house, the new corporation grew from a small experimental plant to a huge, 160-acre set of factories stretching more than a mile along the Kanawha River. The House that Curme built uses a secret process to make such abstract-sounding chemicals as butyl acetate, carbitol, and isobutane. But when these and other substances are juggled by chemists, a legion of practical things pop into being, including artificial leather, films, quick-drying lacquers, aspirin, insecticides, dynamite, and other explosives. One chemical, ethylene gas, helps develop ripe colors in oranges and other fruits; another natural-gas derivative is used in making ethyl alcohol, the potent factor in liquors which had formerly been distilled from grain. While tons of these products are being turned out annually, Dr. Curme has received nearly every medal chemical societies had to offer. The 50-year-old expert, however, is so shy and retiring that his name is almost entirely unknown outside of scientific circles. Since his early days in the Kanawha Valley, the region has been developed to stupendous proportions. In this “birthplace of the Southern chemical industry” there are now more than 275 manufacturing concerns which employ 15,000 workers and pay them about $20,000,000 a year in wages. One of the largest plants in the valley is that of the Ammonia Department of the duPont company. This division was built to make ammoniaâ€”a compound consisting of one part of nitrogen and three parts of hydrogenâ€”and nothing but. Valuable byproducts of various processes, however, were soon found and now the plant turns out more than 100 of them. And they all come from three raw materialsâ€”coal, nitrogen from the air, and water. The first step is to take coal, bake it at high temperatures, and drive off tars and gases. This leaves coke which is ignited and burns to a white heat as air is blasted through it, forming a “blow run” gas mixture rich in nitrogen and carbon dioxide. The glowing coke is then blown by high pressure steam, and “blue gas” is produced containing two important constituentsâ€”hydrogen and carbon monoxide. These and more complicated processes are carried out at temperatures as high as 2,400 degrees fahrenheit and pressures up to 2,160,000 pounds per square foot. From the quartet of gasesâ€”nitrogen, hydrogen, carbon dioxide, and carbon monoxide â€”the products of large-scale work begin to take shape. Hydrogen and nitrogen unite to form ammonia. Liquid ammonia and liquid carbon dioxide combine into ureaâ€”a white crystalline compoundâ€”and nitrates which find use as fertilizers for crops and formerly had to be imported. Ammonia is also made into nitric acid and in that form goes into the making of nitroglycerin, dynamite, and other explosives. Hydrogen and carbon monoxide can be made to react to form alcohol for such things as outboard-motor fuels, automobile radiator anti-freeze mixtures, and food preservatives. To form these products the four initial gases are heated, washed with water and other fluids, cooled, expanded, compressed, and passed over special -substances to make them react with one another more quickly. Nothing is wasted. Those gases, which chemical engineers can’t make into a solid, are burned as fuel for important processes. The gas plant alone is large enough to meet the fuel requirements of 2,000,000 persons. While the Kanawha plant can make a host of commodities on its own, many of the chemicals it produces go to other plants. Extra nitric acid, for example, goes to Richmond, Va., where the pass word is “cellulose.” This substance is found in wood pulp and is familiar enough in its practically pure form as cotton. But when chemists get through with it, it comes out in many fancy forms. Mix cellulose with nitric acid and the end results include smokeless powders for hunters, cements, X-ray films, and coated fabrics. Soak cellulose in a strong solution of caustic soda (sodium hydroxide), and you are off on one of the most revolutionary processes in the entire synthetic-chemical industry. The soda-cellulose mixture is dunked in a special solution of carbon disulfide and results in a thick, yellow fluid called viscose. Then the viscose is squeezed spaghetti-like through tiny holes, forming long thin filaments which can be woven into threads. This is rayon for underwear, dresses, and curtains, and more than 200,000,000 pounds of it are made every year by the viscose method alone. If you want your rayon colored, chemists can supply you with plenty of synthetic dyes. All the brilliant colors of the rainbow come from chemicals found in coal tar, petroleum and vegetable raw materials. But clothes aren’t the most spectacular use for man-made colors. In 1935 physicians started to use a red dye, sulfanilamide, in injections and . by-mouth doses for streptococcus sore throat, meningitis, childbed fever, and other diseases. When the dye saved the lives of persons who had been given up as hopeless cases, the synthetic chemists had another feather in their caps. Doctors themselves are the last persons to try predicting the future of these medicinal dyes, but two more of them have already been found useful in treating sicknessesâ€”a blue dye for leprosy and a red one for epilepsy. Coal-tar derivatives and other substances have been built into a wide variety of other medicines. Though commonly known as fuel for dope addicts, cocaine was the first drug used for local anesthesia in tooth pulling. But it was too expensive and so poisonous that it often killed the pain and the patient, too. The chemists, however, came to the rescue, and succeeded in manufacturing a less poisonous drug, less habit-forming, and less expensive. Other synthetic drugs include acetyl salicylic acid (aspirin to you), and the potent sleep producers or hypnotics, veronal, luminal, and noctol. Perhaps more surprising if not more beneficial than these drugs are artificial perfumes. Natural attar of roses may cost as much as $400 a pound, because 250,000 to 750,000 roses must be crushed to get the oil. But give a chemist two coal-tar extractsâ€”the hydrocarbons C5H9 and C5H8â€”and he’ll make you a pound of fluid that smells almost exactly the same as a rose and costs only $5. A complicated process using such tricky chemical names as salicylic aldehyde and aceticanhydride results in a substance called coumarin which reproduces the odor of new-mown hay as well as any barn. Given the right equipment and the right chemicals, a worker can fill his laboratory with aromas of violets, lilacs, or heliotropes without a flower in sight. Muskâ€”obtained from the musk deer in Asiaâ€”is another high-priced perfume ingredient that can be made cheaply from coal-tar. Although a cat can tell manufactured musk from the real thing, the two substances smell exactly alike to the human nose. Also calculated to trick the senses are synthetic flavors made from gases and tars which yield solutions that taste like wintergreen, vanilla, pineapples, pears, or strawberries. The miracles continue to mount up. By mixing hydrochloric acid (made from common table salt) with acetylene gas, laboratory workers got a complex material that automatically split up into two parts. One of the fractions, when properly treated, is chemistry’s closest approach to natural rubber. The list is seemingly endless: there are synthetic cosmetics, machine-made camphor, artificial leather, and coal-tar vitamins. The modern miracle of synthetic chemistry has only just begun. New laboratories are springing up and new research is going on. More natural gas is being nabbed from the earth’s interior and many substances that were once rubbish are daily being reconverted into useful materials. In my next article, I will tell the story of Plastics-synthetic’s prize productâ€”whose secret the chemists have unraveled.